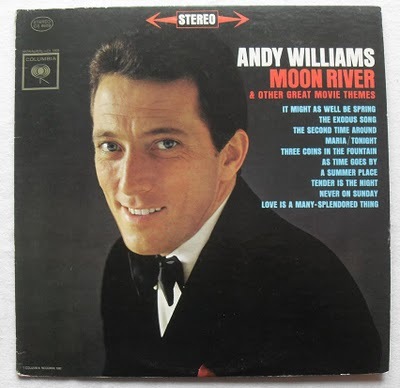 Elvis Enthusiasts Unite: Andy Williams: still terrorizing after all these years. Andy Williams: still terrorizing after all these years. Happiness isn't taking joy in discovering your kid sister is more than a little bit terrorized by a certain Andy Williams album cover because "he won't stop looking at me," propping up said cover near the dinner table in the early 80s and proceeding to enjoy watching her squirm and whine all the way through the meal, dinner after blessed dinner. Oh, no. True happiness, then, is finding album after album of his in the back room of an antique mall on a Saturday afternoon, snapping photos of each, then sending them her way, these twentysomething years later, discovering he still has the same effect on her. Now and only now do I understand true joy. Now my heart is full.